A giant turtle that was thought to have been extinct in the wild has been discovered in Vietnam, according to a group of US researchers. The scientists, from Cleveland Zoo, say they discovered a solitary creature in a lake in the north of the country. 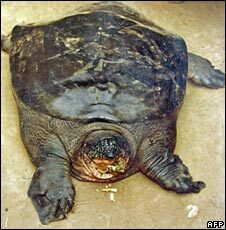 The team has spent three years searching for the species, called Swinhoe's giant turtle. Correspondents warn that it is difficult to verify the existence of a species based on a single sighting. And some experts have cast doubt on the find, suggesting the creature could be a member of a much more common, similar-looking species. However, the zoo believes the discovery to be "incredibly important". "The Swinhoe's turtle is one of the most critically endangered species of turtle in the world," Doug Hendrie, the Vietnam-based co-ordinator of the US zoo's Asian Turtle Program, said in a statement. "This species has legendary status among the people of Vietnam, so this is perhaps an opportunity for the legend to live on." Swinhoe's turtles grow up to 1m long and can live to be 100 years old. Just three other members of the species are thought to be alive in zoos.